I am in the business of beautiful things, and I consider that to be a far-reaching calling. Through my art, travels, and years of business experience, I have been able to build and grow a company that makes beautiful things for women and their families. Through the creation and commerce of these beautiful things, I am able to fund the Giving World Foundation (GWF). The GWF believes in giving the less fortunate a hand up, rather than a hand out, and actively funds and participates in programs that educate children and women so they can become self sustaining. 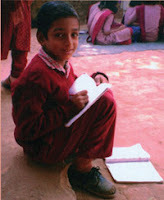 Much of the work we do is in India through a working relationship with Concern India. Through the years, the work of the GWF has become my passion. It is my reason for persevering, and for working hard to evolve the business of April Cornell. Like many retail-based businesses, April Cornell Holdings, has seen its business model rocked and remolded in the past couple of years. Through the wonderful power of internet trade and social media, we are emerging as a modern retailer, wholesale company and licensor. The team at April Cornell shares my vision. We are all focused on the singular goal of being able to grow and build the power of the Giving World Foundation to help others. And that is why we are here. Whether its providing schooling for a child who is the first in her family to ever attend school, or teaching women weaving skills so they can support themselves and their families, we believe we can make a difference. The work of the GWF is vast and broad, and we have a long way to go to realize our dreams. And that is why we are constantly developing beautiful new products that not only enhance the lives of our customers, but also the lives of many others. By being our customer and supporter, you are helping us help others through the Giving World.